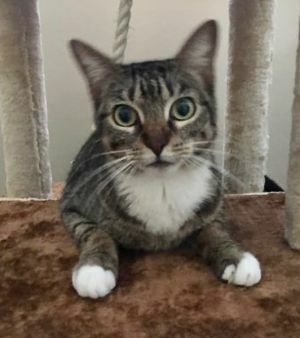 Hi, my name is MINNIE and I am a 3 year old brown tabby female. My housemates and I found ourselves homeless when our owner moved and didn’t take us along. Luckily, we were taken in by Posh Pets Rescue and now I’m just waiting for that special someone to come along and offer me a “Forever Home.” I must admit that I’m still a little freaked out from losing my home, so I hide some of the time. But if I’m PET, I start to PURR and if you’re patient with me. I know I can learn to trust again. Let’s meet! I’m in residence in Long Beach, NY. I am spayed, UTD on shots, and FIV/FeLV negative.